Sunday ( 29 June) is a rest day for me. 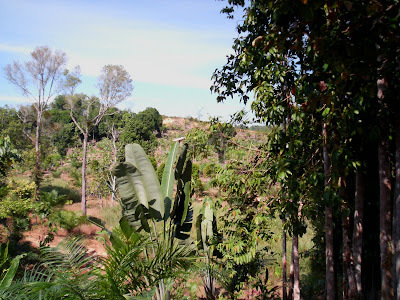 Therefore I just had an early morning stroll around 7.00 am to the top of the hill of Vegetation Island No.1. With my camera hand phone N93i, I took two shots of the surrounding view . Below is the view towards the south. 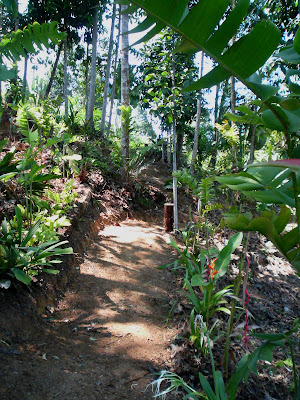 The densely forested area to the right of the picture is the Vegetation Island No.1 where the heliconias planting are in progress. The tall trees on the left of the picture looks small from above here, but are actually 20 meters high. The above picture shows the view towards the east. The tall trees to the left of the picture are the trees that have been here more than 60 years ago. 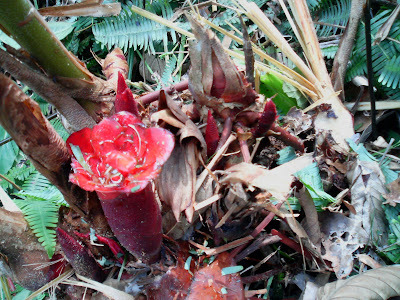 Ground cover in between the heliconias. Two varieties were planted today. The spider lily and a species like that of the scindapsus. Both can be glimpsed below. View from west. This morning I have added spider lily (Hymenocallis littoralis) in between the sassy pink heliconias as seen on the right of the picture. Spider lilies have white flowers and are scented. On the left, however, I have placed a species similar to the 'scindapsus', though at the point of writing I am unable to name it I'll get back to it in the near future. View from the East. 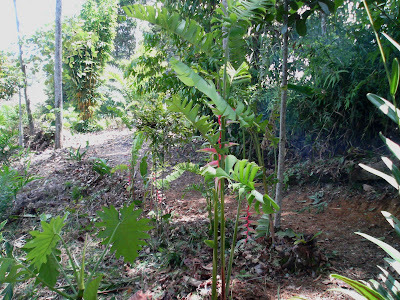 Ati is in the process of planting the 'lipstick red' heliconia, from which is derived the name of the mid hill footpath. 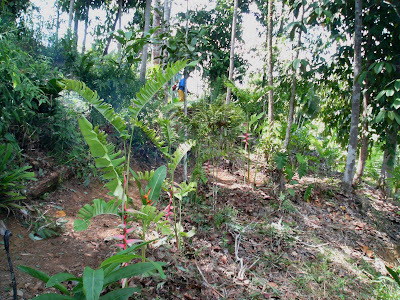 The Mid Hill Footpath is today being planted with Heliconia stricta, seen on the left of the picture. Towards the bottom right of the picture are two varieties of heliconia which has strong orange colour and the other a mixture of yellow and orange colours. View from the west. Observe the belian log that has been cut by chainsaw in the middle of the picture. With the aid of the mighty chainsaw, our morning's work in cutting this extremely hard fallen log of the belian tree was carried out doubly fast. Below is the view of the footpath from the east and Ati is somewhere in the middle of the footpath. 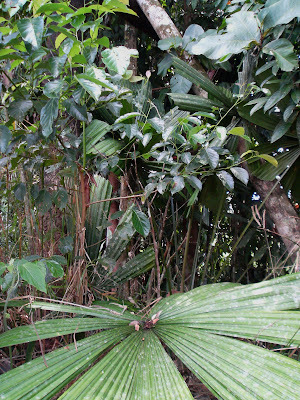 There are at least 50 species of trees within this small vegetation island. I have not yet inventoried the trees. My knowledge of the trees of Sarawak is limited. I think when I am free in future I will seek the assistance of my class mate who worked with the Forestry Department till retirement to name the species found here. 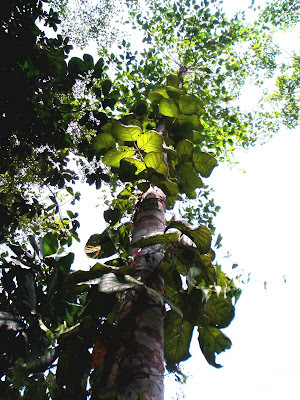 Anyway, the species that stood in our way in the picture above is the familiar belian species ( Eusideroxylon melagangai). Here in Sarawak and just as well in Brunei, we use belian timber to build our traditional houses because it its the hardest tree available in Borneo Island, well you can say that it is equivalent to the teak tree of Thaliand. In Bintulu's kampungs today you can still see the houses built totally of belian from posts to shingles intact even after 80 years ago. Of course the belian posts can last a lifetime even when submerged in water. Life time means , yes a hundred years. Belian timber never rot . The above picture is taken from the proposed top footpath.The' sassy pink' footpath can be slightly seen from the picture i.e. the the lower section of the hill. And finally , the footpath is more or less delineated and cleared. I think planting can proceed tomorrow. Not bad for a good morning's workout. View of the footpath from the west. Total man hours spent = 10 man hours, Ati and me included. 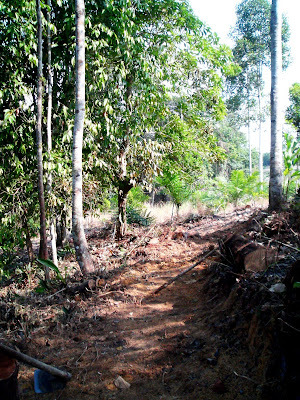 The richness of the forest floor around the sassy pink footpath can be glimpsed from the images below. This complex web of climbing vines. We need Tarzan around here. A multi-layered fernleaf. Will become pinnate once they get matured, like the one above it. Never seen this flowering ginger plant family ( zingiber) before. Love the brilliant red tones. 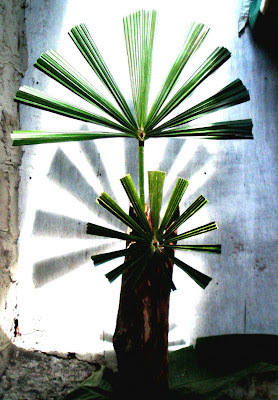 I have always make it a point to preserve this native licuala palm called Licuala spinosa. 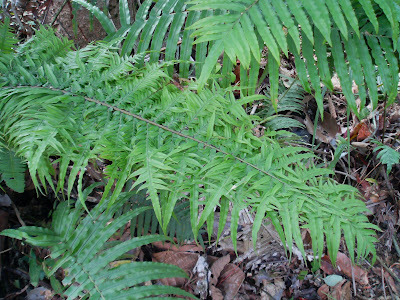 It is extremely difficult to see one with leaves about a meter long in width like the one in this picture. They prefer to hide from the direct sun as they get bleached easily. I have seen it bear fruits once, but it so difficult to propagate it because it takes more than half a year for the seeds to grow into seedlings, if you are lucky. Normally I forget where I germinated them because of the unduly long time frame and my age catching up! Well, what do you do if you have a clump around your back door? I tried my creativity. Took a piece of rotten tree trunk that was hollow and stood it up. 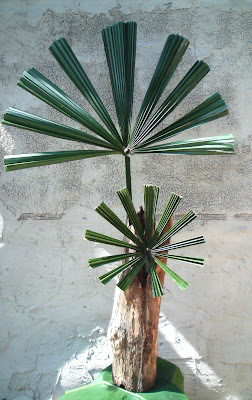 Then I trimmed the huge leaves to match the size of the tree trunk 'plant container' and iin an instant I had created a unique display , very raw, basic, but all the while speaking to me, my senses and make me sing .....Windmills of your mind. 'Windmills of your mind' in silhouette, and taken with a clear background below. The forest always amazes me. And I am so fortunate to have one right behind my back door. This is the kind of magnificence that I would like to retain in my eco-farm. 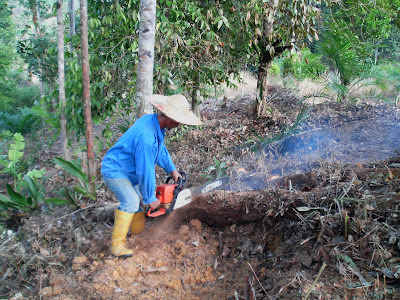 Being an eco-friendly farmer, I must retain as much of the original jungle habitat as possible, for sustainability reasons. Therefore where possible vegetation islands are kept for posterity. 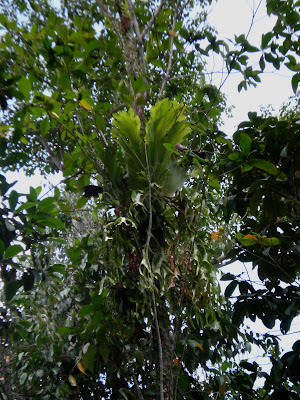 Like this Stag's horn fern ( Platycerium coronarium) that 's just above my head. 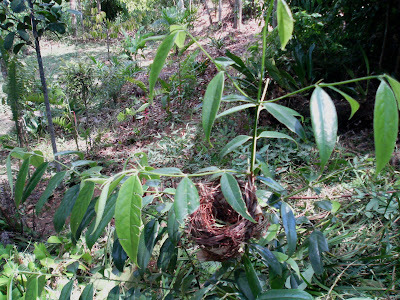 It is more than six feet long, hanging its penduluous fronds and taking the appearance of the Stag's horn. And this giant of a climber. 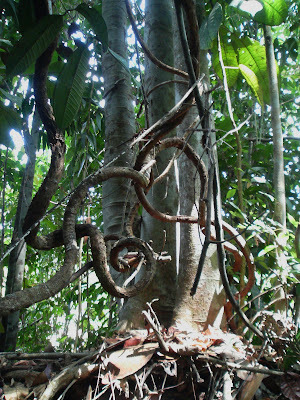 It makes it a habit to turn and twist around this erect tree , reaching for a better view of the forest from upstairs, the fresh air it offers and lots of sunshine too. Isn't it not true of penthouse dwellers? This is Vegetation Island No.1. 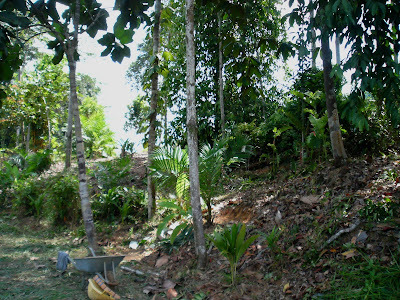 In this hill are tall original trees that constituted the jungle behind my chalet , about fifty meters away. In the far background is Vegetation Island No.2. The total area of these two vegetation islands are an acre and a half in size. 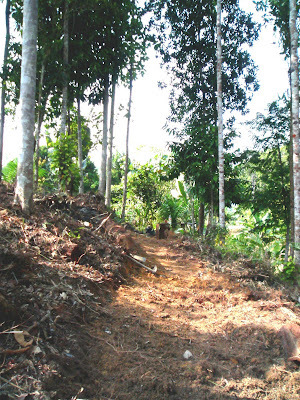 These two small hills and the valleys around them make up the area to be developed as Heliconia Valley. But one thing at a time. Today I shall focus on the first footpath to be cleared i.e. the sassy pink footpath in respect to the beauty and splendour of heliconia 'sassy pink' species. The above is a view from the south-east. 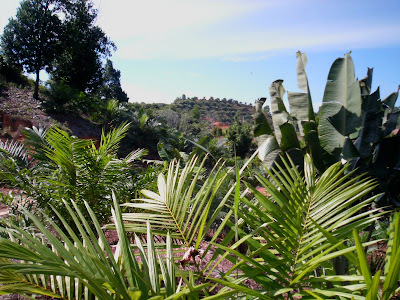 Observe the tall trees that have been there hundreds of years ago, and recently introduced ones like the oil palm tree, coconut tree and banana trees that occupy the lower section of the hill. My equipments and tools are temporarily parked at the valley floor in the foreground. This morning ( 23 June) my project involves the demarcation of the footpath as above, which follows closely the contours of the hill. All dead leaves, humus, branches and twigs are swept towards the sides of the footpath. 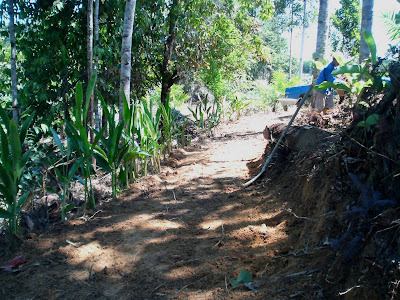 At present the footpath shall remain earthen for budgetary reasons. View from the west. 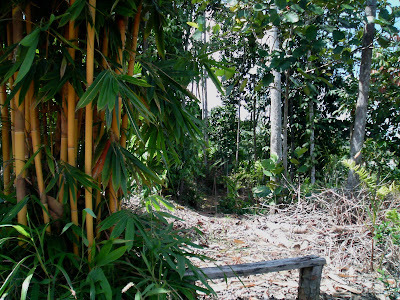 A clump of yellow bamboo provides shade and marks the western entrance to the sassy pink footpath ahead. View from the west, half way along the footpath . 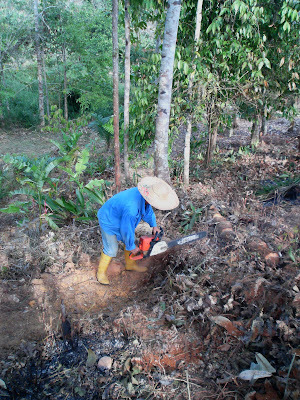 Ati ( in blue coverall) is busy clearing the undergrowth using a bush cutter in the far background, somewhere in the middle section of the hill. View from the east. 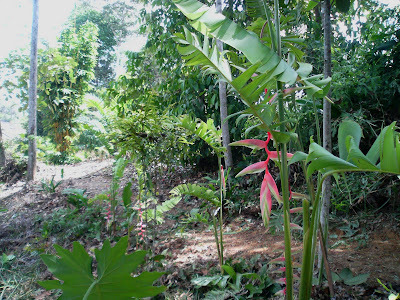 I had the honour, delight and fun doing instant transplanting of this tall stand of heliconia' sassy pink' to mark completion of Phase I of the 'Sassy Pink Footpath. Total time taken to complete the works was 10 manhours, myself and Ati included. In the next posting I will describe the wonders we discovered while clearing the undergrowth.